The new Seoul Eastern Detention House, or “Dongbu Guchiso,” is located on Jeongui-ro, or “Justice Street,” in Munjeong-dong. Across the street are the Seoul Eastern District Court and Seoul Eastern Prosecutors’ Office adjoining each other. Opened a little over a year ago, Dongbu Guchiso has become the judgment grounds of old power, as it accommodates many “celebrities” from the administrations of presidents Lee Myung-bak and Park Geun-hye who are being prosecuted under the Moon Jae-in government’s campaign of “condemning past wrongs.” Lee, the three most recent directors of the National Intelligence Service and some former cabinet ministers and presidential aides are among its occupants. 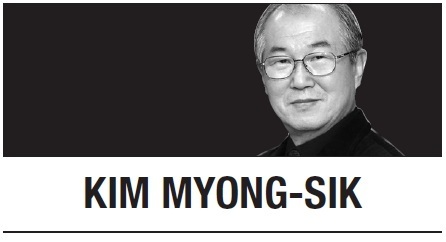 One night last week, I watched Justice Street turn into a horrible scene of lawlessness when Kim Ki-choon, former chief of staff to Park, was freed after 18 months of incarceration, the maximum detention period for a criminal defendant. For hours from late in the evening on Aug. 5, the space in front of the prison’s main gate was seized by hundreds of demonstrators protesting the release of Kim. Kim is accused of abuse of official power in connection with the making of a blacklist in the art world allegedly to discriminate against leftist figures in the government’s sponsorship programs. Kim was given three years in jail by a district court, with another year added in a second trial. He appealed to the Supreme Court and the top court now has to try him without detention. He was not being freed on bail nor had his sentence suspended, but was being sent home because of the time limit on detention. If the highest court hands down a jail term longer than 18 months, Kim will be brought back to prison, but he will remain free if a lighter sentence is given. The protesters that night were dissatisfied with these court proceedings. “No freedom for Kim Ki-choon, co-conspirator of Park Geun-hye,” their pickets read. When I reached the place about an hour before midnight to see Kim, a college friend, coming out of prison, 200 to 300 people holding signs of Minjunochong, the radical umbrella labor union, and some other groups were sitting on the pavement before the guard’s cubicle. A van equipped with six loudspeaker horns on top was blaring as a leader spoke into the microphone to criticize Kim’s upcoming release. Somebody told me that the nightly outdoor assembly was legally reported to authorities. A few dozen police troops were posted there. Their primary mission, as I saw it, was to prevent physical contact between the two opposing groups rather than to keep demonstrators under control or put down the noise that seriously disturbed residents of high-rise apartments nearby. As it turned out, the police failed to deter barbaric violence from destroying the sanctity of the place representing law and order. Exactly at midnight, Kim Ki-choon appeared at the gate escorted by two prison guards. The moment he walked to a waiting sedan, scores of media people dashed to him flashing cameras and hurling meaningless questions. As Kim entered the car without responding, demonstrators at once broke through the line of police and surrounded the vehicle. They punched and kicked at the car while some lied down on the ground to prevent it from moving. Police tried in vain to remove the human obstacles; when several police troops dragged one out of the way, more came to fill his place, and when the car moved in reverse, many turned to the rear to stop it. It took over 40 minutes for the car to crawl inch by inch and finally escape from the pandemonium. Police made not a single arrest for obstructing performance of official duty or intimidating the man confined inside the car. We have seen acts of violence, damaging facilities and causing injury to people at the scenes of labor strife or other social conflicts. But the outright denial of public order and peace was the last thing we should expect from a place like Justice Street that symbolizes the rule of law in this democratic republic. Was it police incompetence or negligence? We had the answer when we saw police quickly arrest the man who attacked South Gyeongsang Province Gov. Kim Kyung-soo coming out of an independent counsel inquiry the other day. The Law on Assemblies and Demonstrations had originally prohibited outdoor demonstrations during the hours after sunset and before sunrise. Since the Constitutional Court ruled in 2009 that this provision was “inconsistent” with the civil liberties provisions in the Constitution, Korea’s dark nights have served as gruesome environs for activists of various causes who care little about the nocturnal peace of citizens. During the night of disorder at the Eastern Detention House, I felt sorry to everybody there -- the Minjunochong men and women in front of the car, the police troops who were forced by the almighty protesters to give up their proper mission, the residents of Munjeong-dong apartments who came to the origin of unbearable noise but found nobody listening to their complaints and, of course, to Kim Ki-choon, who rose from a prosecutor to justice minister in the record shortest time, but stayed around power a little too long and met misery in the twilight of his life. Sadness turned to anger as I saw the road sign “Jeonguiro” before the prison gate, which reminded me how the goddess of justice is being mistreated at many spots of protests in today’s Republic of Korea.